Green Technology is an eight-volume set that examines the relationship between human activities and their sometimes harmful consequences for the environment and explores new methods of repairing and restoring the Earth. Approaching environmental issues confronting society from a technological perspective has spawned significant controversy, and the books in this set present all sides of the debate. Designed to complement science curricula, the set also covers relevant history and new green technologies and innovations that will contribute to the field in the future. 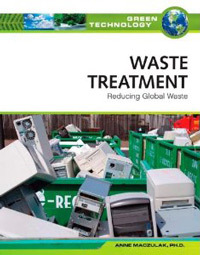 Waste Treatment: Reducing Global Waste explores how the waste-treatment industry removes, processes, and disposes of human, household, and industrial wastes. The book looks at the global waste problem and the different classifications of materials that are treated through waste management and examines the waste stream-various wastes that move through the environment toward a final disposal. Sidebars citing actual examples and statistics, figures, and case studies enhance fundamental concepts and give the reader a sense of the urgency of the issues related to waste treatment. The book contains 40 color photographs and line illustrations, a glossary, a detailed list of print and Internet resources, and an index. Green Technology is essential for high school students, teachers, and general readers who seek information on the important issues that affect the environment worldwide.